Nissan has launched a new longer-ranged version of its Leaf electric car that can be driven by just one “e-Pedal” for both accelerating and braking. The new Leaf can travel up to 235 miles between charges under European driving conditions and can be fully charged in 40 minutes with fast chargers, although electric cars typically run 20-25% shorter distances under real-world driving conditions. Nissan says that its new e-Pedal, which drives the car forward when depressed and brakes when pressure is released, should increase driving efficiency and be all that a driver needs to operate the vehicle for around 90% of urban driving. The Leaf will slow to a halt and can hold itself steady on an incline without the need to depress a brake pedal, of which one is included for emergency or aggressive braking. Most electric and hybrid vehicles have the option to use regenerative braking when not actively accelerating or maintaining speed, which means they decelerate more rapidly when the accelerator pedal is released than petrol or diesel-only cars, turning the excess speed into electricity to charge the battery. The e-Pedal is the logical extension of that mode using both regenerative systems and brakes, but like regenerative braking, can be disabled by the driver. The updated version of the world’s most popular electric vehicle, of which 283,000 have been sold since its launch in 2010, hopes to better compete with newer entrants from Tesla and General Motors, undercutting them on price by around $5,000 (£3,800) in the US. The Leaf falls short on range, however, with both rivals offering larger batteries so they can drive further between charges. The restyled 2018 Leaf is lower and more sculpted than its bulbous predecessor, billed as sleek and aerodynamic to maximise range. It also comes with optional new “ProPilot” semi-autonomous driving features that can keep the car centred in a motorway lane and stop it from hitting objects in front, as well as being able to park itself. The new Leaf also has 38% more power, increased to 147 horsepower reaching a top speed of 89mph, which again falls well below specification offered by rivals. The new Leaf is rated for 248 miles in Japan, 235 miles in Europe, but only 150 miles in the US, due to different range tests for electric vehicles in different territories. Nissan said it would launch a longer, US 200-mile rated version of the Leaf in 2019 that would be more expensive. The 200-mile mark is considered by many industry experts as the range needed to ease driver fears that they’ll run out of juice before ending their trips in the US, but even then range is still the biggest obstacle to widespread adoption of electric cars. Several breakthroughs in battery technology are likely needed before they become affordable and practical for the majority of regular consumers. “There really is no outstanding attractive quality about an electric vehicle,” he said, noting drawbacks such as finding charging stations, as well as the time needed to charge even with fast chargers. 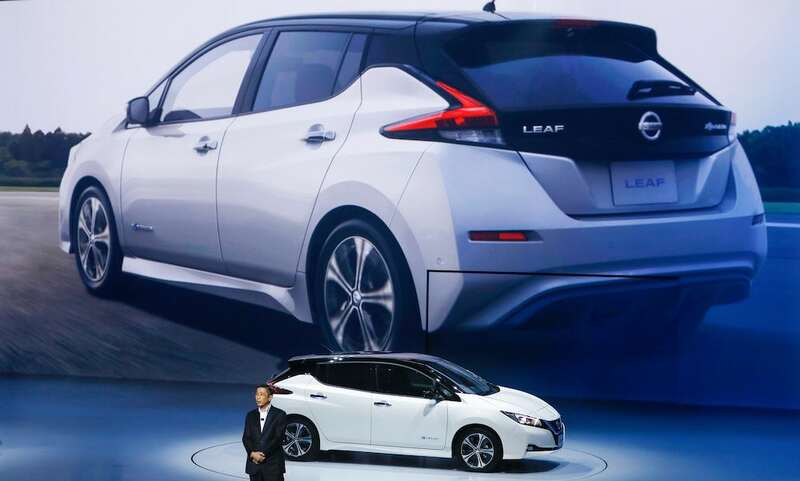 The Leaf remains an important part of Yokohama-based Nissan’s branding as a symbol of the company’s commitment to the environment.